Ever since I learned about El-Funoun, the oldest dance company in Palestine, I felt drawn to go there. Last spring I had the opportunity to visit the company with four NYU colleagues in music and dance. I got to see with my own eyes why this group has captivated audiences the world over. Our driver took us from Tel Aviv to Ramallah. 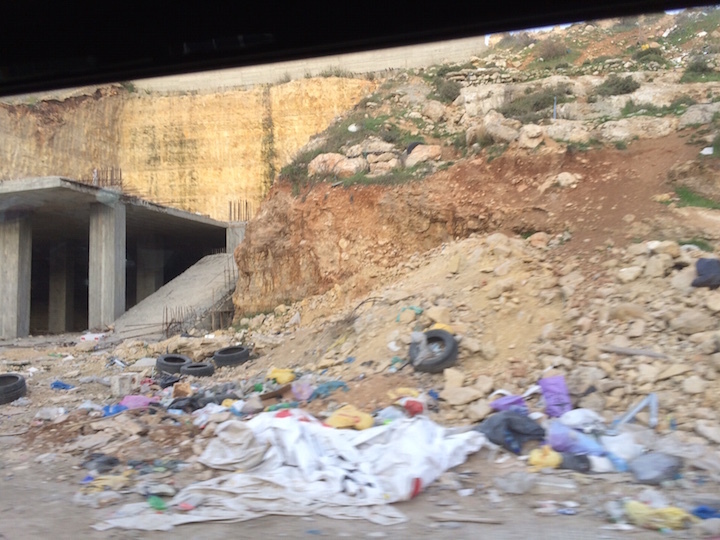 As we crossed into through Qalanida, the Israeli checkpoint, the scenery quickly became quite bleak. Rocks, stone, and dirt were everywhere, as though piles had accumulated on the way to building something that never got built. And yet, El-Funoun has survived for 38 years. 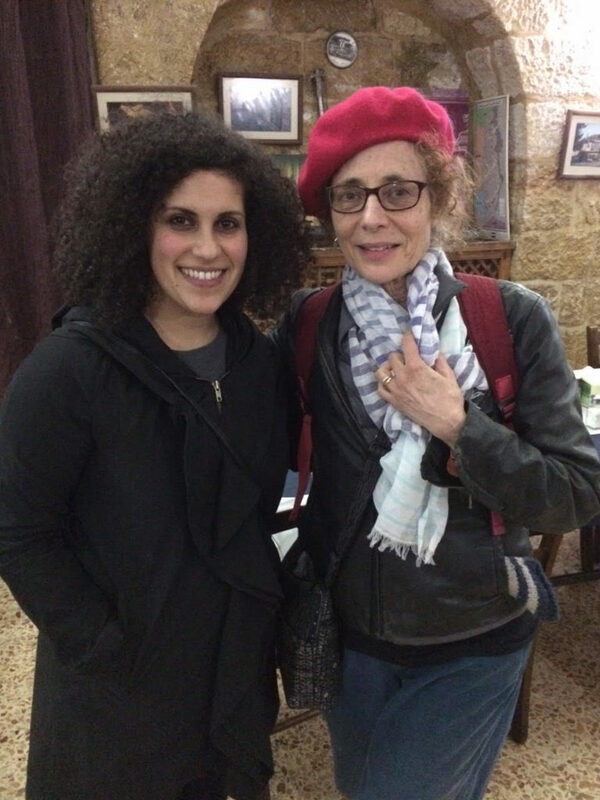 When we arrived at El-Funoun’s dance center, Noora Baker, the young woman whom I had e-met through choreographer Yoshiko Chuma, welcomed us. As the director of training & productions, Noora described their situation with both grace and frankness. She took us into the office of executive director, Khaled Qatamesh. 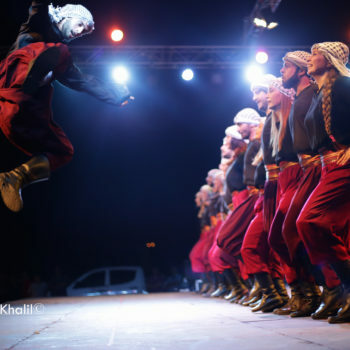 El-Funoun Palestinian Popular Dance Troupe began as a small dabke group (dabke is the Arab circle dance native to the Middle East) and grew into a large group that tours internationally. The many awards and trophies from all around the world, crammed into one shelf in Khaled’s office, attest to their popularity. In order to give us an idea of the hardships they face, Noora told us that most of the dancers in the company had been held in prison, some of them multiple times, often with no explanation. I tried to imagine living with that kind of constant threat. “El-Funoun is about keeping the culture alive, when it’s constantly threatened to be erased. It’s an existential struggle. 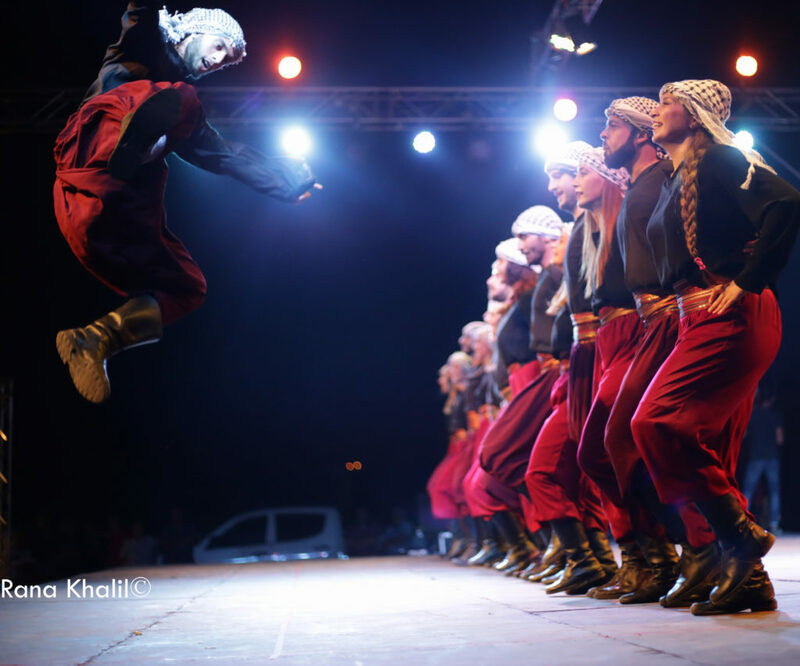 The organic growth of dance in Palestine is built on traditions. With our dancing, we connect with our past, with the land of our ancestors that has been taken away from us. In my mind, however, art has many possible goals and methods, and we should each be free to live and work as an artist in the way we choose. Although…if I lived under the difficult circumstances the Palestinians face daily, I too might feel that art should have the single goal of fighting oppression. In reply to Khaled, I gave the example of the Alvin Ailey American Dance Theater, which built its repertory on the Black experience. However, the Ailey rep only occasionally hints at discrimination or oppression. A recent example is Kyle Abraham’s Untitled America for Ailey, which has a soundtrack of people talking about relatives who are incarcerated. In the U. S., mass incarceration one of the major issues of social justice. Noora explained that there are about 20 dabke steps and all of El-Funoun’s work is based on that. As with tap and ballet, the choreography comes in how the steps are put together, and each choreographer does that differently. “We are one of the rare organizations in Arab world that depend on volunteer work. We bring people together who believe music and dance can liberate us from our oppressors. We do one new production every three or four years. Every production has a theme based on social justice. After these explanations, Khaled and Noora led us to a studio—the same studio you see in the YouTube clip above—where we watched choreographer Ata Khatab working on a new piece. Ata’s father, Mohammad Ata, was a co-founder of El-Funoun. About 25 dancers ranging in age from about 19 to 40, were raring to go. They are mostly volunteers, but some have jobs in the building, maintaining the facilities or helping with administrative chores. One young man had performed dabke as a guest with Yoshiko Chuma at LaMama a few years ago, and I remembered him in that performance. As part of the rehearsal, Ata led the dancers in a discussion, asking, How are you a warrior in your everyday life? Each one spoke up in a strong, clear way. (Noora quietly translated for us.) I felt, in that room, that everyone wanted to be there, that this opportunity to dance was essential for their well-being (though what I came to understand is that even the mere concept of well-being is a privilege). As we watched, Ata made a new section. About 10 dancers slowly put a hand on another’s shoulder, then lower themselves to the floor. 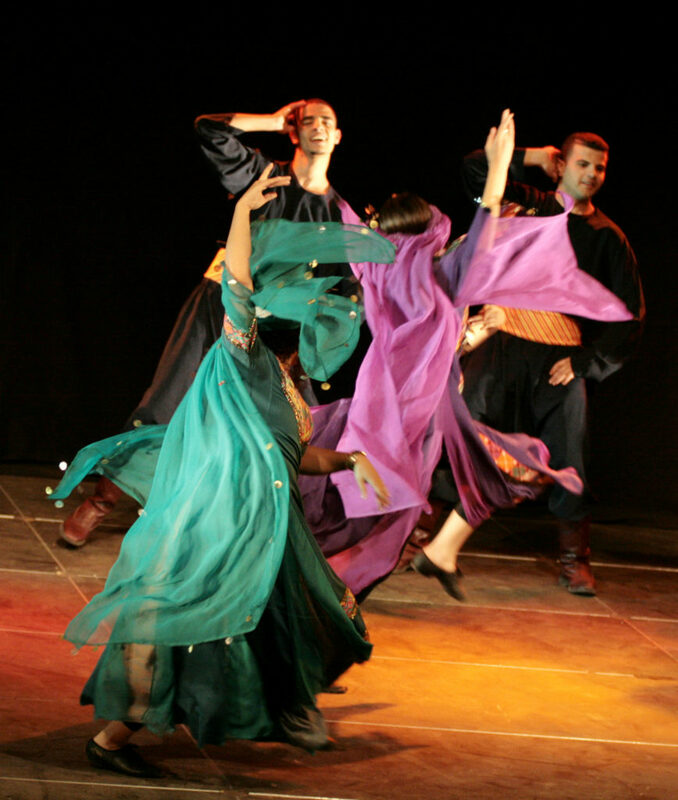 From a squatting position, they thrust their legs out in a few rhythmic dabke steps. jabbing the floor with their feet. Then they slowly rise and drop their hands away from each other. After working on the new choreography, they showed us one of their signature dabke dances—and blew us away. They tore across the floor in full throttle with joyous camaraderie. This was not a “folk dance,” but an amped up, fierce celebration of their own power. Their lack of consistent training was irrelevant; they danced with great fervor, knowing they were reclaiming the dance of their culture. It was kinetically and choreographically exciting. As I watched them throw themselves into the dancing, I was thinking of what their lives were like. While witnessing this tremendous heart and spirit, I was choking back tears. In any case, Khaled’s question, “What are you doing in your community?” lingers with me.